Tim Crouch directs his new play Beginners, a work that inspires us to examine our relationship to growing up, living and grieving in this exquisite and joyful portrait of being a child in a complicated world. Seen through the lens of a family holiday, Beginners is a dazzlingly original work, where childhood and adulthood collide in a funny and vivid exploration of the redemptive power of art in the face of loss. Tim Crouch is an award-winning writer, director and performer. 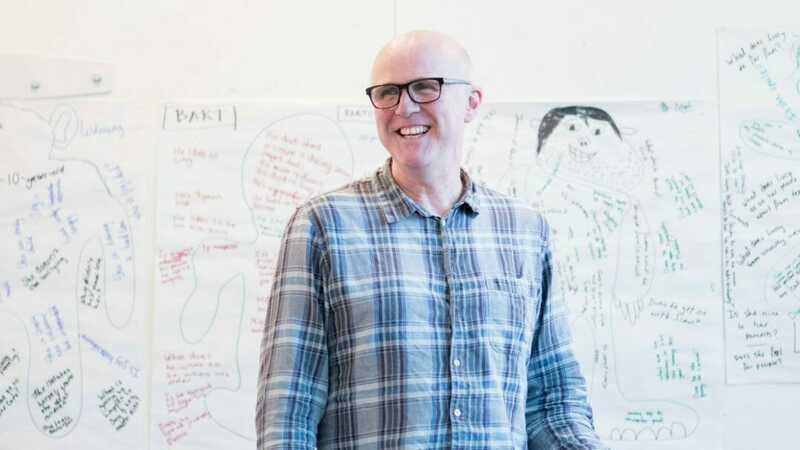 His previous work at the Unicorn includes the acclaimed Jeramee, Hartleby and Oooglemore, Adler and Gibb and his acclaimed one-man show I, Malvolio. We spoke to Tim to find out more about Beginners. Your play Beginners is at The Unicorn Theatre, what can you tell us about it? This is the story – but it does no justice to the depth of how the story is told. Four characters reflected through both adult and child. Four characters dealing with change and loss and hopes. Four characters stuck together in a confined space – working out how to live with each other. Our understanding of what’s going on changes as the play progresses. It’s starts as a stripped-down adult mystery and it ends as the most lavishly theatrical celebration of childhood imagination. The play wears its themes lightly – but deeply. The characters are lovingly drawn. I’ve never written such a character-led play – but one that still contains the formal experimentation of my adult work. Beginners is good for 9 year olds. But I’d say that it’s equally good for adults. Where did you get the idea for Beginners from? I think I wrote it because my children have grown up. I love the adults they’ve become but I miss the children they were. I often think I see the children that they were in the adults they’ve become and that makes me inordinately happy and also a bit sad. Beginners is about the continuum from youth to adulthood – the ties that bind grown-ups to their childhood. Also, I own a pair of size 21 Nike trainers that I like to wear when the mood takes me. My feet are dwarfed in those shoes, like clown shoes, like the feet of a child in their parents’ footwear. That image was the trigger for the form of the play. Are there any differences between writing a play for adults and a play for children? With the beginnings of any play, I think about my audience as a collaborator in the theatre process. What can I leave them to do? What contradictions can I ask them to resolve? What job can I give them? This process applies to adult and young audiences alike. With a young audience, there is a greater responsibility to metaphorically hold the hand of the child – but not necessarily to dumb down the subject matter. Young people live in the same public world as adults. They see the same things, experience the same feelings. How do you make sure you tackle difficult issues so they are appropriate for a young audience? I don’t think that I really ever ‘tackle issues’ in my plays. That’s not how a play starts for me. I write what comes and what comes is different depending on what I’m obsessing about at the time and the audience I’m thinking about. The process of selection and framing begins as soon as an idea emerges. I think about my audience a lot when I write. It’s a natural, unconscious process to consider what’s appropriate for them. Why do you think it’s important for children to experience theatre at a young age? Children are experiencing theatre all the time. In their homes, their playgrounds, their schools. The organisation of narrative and imaginative play is as important to a child’s game as it is to a playwright. Children are natural dramatists in their play. They structure and create character. I think It’s vital that a child sees their process repeated back to them by the adults – and with the formal validation of the broader culture. To understand that adults also engage in imaginative play and story-telling. It’s an ambition to see theatre for young people regarded on the same critical level as theatre for adults. That equal regard exists in other European countries – Belgium and the Netherlands for example. Young people’s work is rooted into those countries’ culture. (it’s no accident that there’s a Dutch character in Beginners.) I think Purni Morell (the outgoing artistic director of the Unicorn) has made significant advances in this mission. But there is still a long way to go. Young people’s work is still perceived as a marginal presence in the UK theatre ecology. How does The Unicorn, and Beginners support teachers who bring pupils to see the play? There are a lot ideas and themes to unpack in Beginners. But I think it’s important that a young audience get an unimpeded run at the play – that they see it without knowing anything about it, that they experience it fresh for the first time, that they encounter it undistracted by educational agendas or academic demands. But it’s also important that the teachers know how to pick up the play after their pupils have seen it. And this is where the Unicorn excels. They work with the artists – the writer, director, cast – and with local schools and teachers. There’s a teacher’s resource pack (which contains spoilers). There are a series of ‘Insight’ performances during the run – where the company will engage with the audience after the show. And there’s also an inter-generational programme of work connected to Beginners that brings young and old together. This project will culminate in a performance made in response to the play. My work – and its audience – feel totally supported by the Unicorn. Beginners is at The Unicorn Theatre 20th March – 15th April 2018.